Although a pure cloud play may work well for the small to medium business – Enterprise Customers will not fair as well. During our investigation and ongoing discussions around Cloud computing since – we discovered that many Enterprise customers were not ready for a pure Cloud Based Solution. Why? The process, environment, and technology needs to mature in order to pure cloud play to be viable. Most Enterprise customers are not a green field but a brown one. They have invested considerable time, resources, and effort in their current systems and processes. Revamping all at once typically is not a viable solution not just from a technology perspective but also a business. Key processes and procedures that have been developed for hosted, on premise solutions (essential for Private Cloud) exponentially become more critical in a hybrid model. More often then not the assumption is that by outsourcing you are also mitigating risks, costs and responsibility for these critical factors. However, what the reality of the recent Netflix & Amazon outage have shown us is that even the largest customers of Cloud Providers can be impacted from an outage. That outsourcing your entire environment to a single provider may be a costly mistake. In Visible Ops Private Cloud (ITPI, 2011)– we stopped at Private Cloud because many customers were not at an internal maturity level to successfully adopt and deploy a hybrid cloud model. Furthermore many of the tools that are needed to support best practices needed for a hybrid approach are still either not available or in early phases. For example, in the case with Netflix – how would they easily failover to another cloud provider or internal private cloud to insure their customers were not down? That would require tools that enable true cloud bursting not only from Virtual Machine level but also the licenses and fabric that support the migration from one cloud provider to another. In today’s world of bring your own license at your own risk – the Enterprise assumes a lot of risk without a lot of assurance. As an Enterprise – how do you mitigate risk while leveraging the value of cloud? Invest in a Hybrid Model Upfront– although you may have either your primary or burst capacity come from a cloud provider – it is critical that you have a private cloud with disaster recovery planned in case the cloud provider has an outage. Similar to needing high availability and disaster recovery for your internal systems – failover will be critical for hybrid implementations. Although on the surface ROI & TCO for pure 3rd party cloud play may seem more cost efficient – the first priority 0 outage such as Netflix and Amazon will force hybrid conversation. Better to plan for it from the beginning then wait until there is an issue. This will provide true ROI and determine if Private, Public or Hybrid are the best approach. Negotiate Service Level & Precedence – just like application dependencies and precedence needs to be set for your private cloud – it should also be in place for 3rd party providers. Remember in life you do not get what you deserve but what you negotiate so it is critical that you negotiate the right level of precedence based on the criticality of the application the provider is supporting. You have a responsibility to insure that the service levels agreed to by your company with both internal/external customers can be met by the cloud provider, you understand the critical path analysis and contingency plans. Look for Low Hanging Fruit – the higher the dependency of the business on the service or application – the higher the risk. Moving to the cloud requires changes not only in technology but people and processes. To assess where your company is on the maturity scale it is imperative that you start with a less critical application that can be scaled out to the masses. This will enable you to determine company’s ability across people, process and technology for the consumption of cloud based solution and assess impact to user base. Crawl, Walk, and then Run Approach - Before taking on a large program rollout – understand what areas need to evolve. A good example would be to take on a single communication channel such as email with MS Exchange for a subset of users and expand out before a complete set of communication channels such as unified communications across voice, chat, and email. Make sure your Application Providers are on Board – many application providers have restrictions on running Enterprise Applications in a 3rd party cloud but may not have them if you are using a hosted model (such as a virtual private cloud that is an extension of your own private cloud). Before you bring your own licenses at your own risk – make sure you can do so legally without incurring additional costs or compliance risks. Many companies struggle with where to start on their journey to the Cloud. In fact, many we interviewed for Visible Ops Private Cloud and Client4Cloud struggled with trying to figure out the best way to move to cloud or user centric computing model. In today’s technology-dependent age it is difficult to migrate all systems all at once without upsetting the balance required to maintain business agility and efficiency. This is why the more successful implementers took a different approach. 1) Create role of Product Manager – Product managers in IT serve the same role and purpose as the product manager in the traditional vendor setting. These individuals are the leaders of the group that take into account market, customer (consumers of the service), and business impact of adopting technology. These individuals need to be able to create a succinct strategy, obtain buy in from key stakeholders and effectively communicate with their customers and the organization as whole. Self Starter - Effective product managers are those that look for solutions to problems and lead to garner support. They do not wait but initiate ideas, strategies and work to identify gaps. Good Communicator – – Product managers should be comfortable in all forms of communication – written, oral, and social. Ideally they can write frequently asked questions, create presentations, and be able to provide vehicles to communicate out. Responsible – – Product managers have to be responsible for their products – just like a parent does a child. These individuals need to insure that even if other areas in the process fail – they are willing to go the distance to insure the needs of their product are met in a timely fashion to avoid impact to the business and users. Planner – – Product managers need to have foresight to understand where technology is going, identify requirements from the business, and able to create the plan. Remember vision without execution is hallucination. 3) Crawl, Walk, Run - Rather then diving into the latest and greatest it is critical to initiate a succinct pilot that involves key stakeholders (not just IT but from Business, Audit, Security, and End users) to understand and mitigate risks takes place. Typically the more successful companies will spend more time in planning and less in execution. The product manager should be responsible and accountable for insuring that the plan from inception to end of life for their products is created. This includes any betas, user acceptance and pulling in key stakeholders. To learn more pick up your copy of Client4Cloud or Visible Ops Private Cloud from Amazon today! Global – Mobile Workforce – devices are no longer just a tool but a trend and status symbol. A greater number of knowledge workers participate in a flexible work style. Bring Your Own Device (BYOD) and Bring Your Own License (BYOL) trends – while more workers are bringing their own devices – cloud providers are telling Enterprise customers to bring your own licenses at your own risks. Licensing as a Service- What is it? Why care? Paradigm shifts present significant opportunity for new technology and innovation in a disruptive market. During my research for Visible Ops Private Cloud (ITPI 2011) and Client4Cloud (Client4Cloud 2011) – nearly all of the interviewees from the Vendors, to the analyst but most importantly the customers indicated that the real opportunity around Cloud is hybrid environments. Achieving hybrid clouds will be difficult at best due to limited solutions and controls over applications. Few customers have a strong understanding of their licenses usage for on-premise systems (desktop to the data center), resulting in more questions for customers than solutions or answers at the moment. What does a Licensing as a Service Solution provide? Visibility and control across all the 4 major areas in the stack – Users, Apps & Data, Management (fabric), and the cloud (enabling technology). Licensing as a Service aggregates the handshake to enable visibility across the Cloud Service Providers, Cloud Service Brokers, Software Vendors, and Enterprise. The opportunity for many will be figuring out the handshake, what it means for the consumers (from SMB to Enterprise) and how to reduce impact to enable both hybrid clouds and user centric computing. Without a Licensing as a Service solution customers will struggle with increased costs by paying both the Service Provider to rent a license as well as their current Enterprise agreements. Without these solutions many will continue to experience “Cloud Stall” similar to virtual stall (Andi Mann J). Client Stall is also another byproduct of poor license posture. For example, several customers that were interviewed reported having to remove their systems management tool from their virtual desktop infrastructure or to leverage a terminal services solution such as Citrix XenApp because of the issues caused from a mass proliferation of licenses due to machine centric solutions. What can customers do today? Client4Cloud defines the base principles of the challenges that occur with the machine centric approach. 1) Move Away from the Machine! Companies will first have to shift their processes, technology and resources toward a user and application centric approach based on service portfolios. 2) Invest in Planning and Analytics. You have to know what you have before you can figure out what you need. Orchestration and Optimization only happen after you Cut through the Cloud Clutter and Design Your Services Not Systems. (Visible Ops Private Cloud, 2011). 3) Understand where the biggest risks are and work with your vendors. There are so many places within a virtual environment that applications can be lifted and shifted to. Virtual applications and/or machines can hide. 4) Ask Vendors to “Share” the responsibility for accurate discovery. If vendors say you can run your applications in the cloud, hybrid clouds or virtual desktops – they should provide a way for you to control and have visibility over your purchased licenses based on the use rights provided in your agreement. Without having a strong handle on license position and processes in place that are geared toward user and application centric environments – companies will continue to struggle with their cloud and user centric universal client implementations. More will be available in Client4Cloud: I Speak Virtual and on www.client4cloud.com. Within each layer of the stack there are parallel process, skills, and technology that needs to be in place to bind each layer together. Similar to how eggs can bind the layers of a cake either as part of the frosting or the actually cake itself. These binding layers in their own right will create new market opportunities and challenges across Software Producers, Enterprise, Cloud Providers and Service Brokers (aka managed service providers) to fill the gaps. What are some of the binding layers that need to be addressed and why? Licensing as a Service – automating the license tracking, usage, and authorization across cloud service providers, cloud service brokers, software producers and enterprise customers across heterogeneous clouds, environments, and models. The electronic “postal service” for the Cloud. Transformation Automation from Client to Cloud – Planning, Migration, Orchestration and Analysis to enable visibility, clarity and control in identifying, on boarding and maintaining a bifurcated systems during the transition from current to App/User centric paradigm. Process Transformation & Automation – convergence requires shifting current legacy product and technology thinking to Users and Services they are consuming. As an industry we will have to rethink how we package, create, price, and deliver “Services Not Systems (ITPI 2011) across Users, Apps, and Data. Client4Cloud will be available in Print This Spring 2012! The first book in the Client4Cloud series focuses on process automation and best practices for shifting from a machine centric to a user centric approach. The print copy will be available by April and electronic copy is currently available on Amazon.com. I am very pleased to announce after nearly 2 years in the making – Client4Cloud: Desktop Transformation to Universal Clients will be officially launched this week. First on Cloud Commons on December 5th and on December 7, 2011 at Upcon (Clash in Cloud Presentation). Or you can read the highlights in the recent Tech Republic Article 10 Steps for Transforming Desktops to Universal Clients for the Cloud. Recipe for successful desktop transformation to universal clients for the cloud based on prescriptive guidance and lessons learned from leading industry and customer experts. Consumerization of IT, the new generation of digital native users, looming regulations and a more global/mobile workforce have created considerable risks and challenges for companies today. Early attempts at balancing growing user requests and business directives through client virtualization resulted in failed projects and dissonance amongst very talented architects, developers and visionaries. In short, with any new markets many of us didn’t know what we thought we knew but have learned quite a bit along the way. Although many would love to give up – the requirements that led them to consider client virtualization in more nascent forms have not gone away. The increased adoption of productivity technologies, occurrences of cyber security attacks and overall risk to the company have created a proverbial client clash in the cloud between users and IT. The need to have a cohesive strategy to create universal clients (apps and data that follow the user) will become even more prevalent as users adopt consumer technology like Apple iCloud and Amazon Kindle that enable them to do that across various devices (PC, Tablet, Smartphone, Reader). The technology has come quite a way across client, server, and user virtualization. However, clarity around people and processes required to create the larger cohesive roll out from client to cloud has been cloudy at best. To be successful in their desktop transformation efforts companies need to have a strategy that spans from the cloud (infrastructure) to the client (end users) which takes into account environment (context/tasks). Having deployed thousands of applications to millions of users across both physical and virtual paradigms over the last two decades – it was plain to see that something was remiss between the vision and implementation reality. In short, in order for desktop transformation to universal clients to truly be successful – a new approach is needed. From inception we have to shift from a machine centric to a user centric model. Client4Cloud provides prescriptive guidance for customers to map their journey based on their needs (business, users, and context). What makes Client4Cloud unique is the unbiased perspective for customers by customers across both bleeding and leading edge with validation from early industry pioneers. All research was independent of any company, products, or other agendas that could cloud the conversation or outcomes. Objectivity was achieved only through validation and feedback from pioneers representing all major players in client virtualization from the application to the desktop (Citrix, Microsoft, VMware) and upcoming areas around the user (AppSense, Liquidware Labs). Input was provided from individuals such as Simon Crosby – Bromium founder and former CTO Citrix; Barb Goldworm – Focus Founder and formerly of Novell; David Greschler –Founder Papershare formerly of Microsoft/Softricity; Andi Mann – VP Cloud for CA and former EMA Analyst; Dmitry Shkliarvesky – VP Pro Services AppSense and formerly at VMware/BMC/Marimba; Tyler Rohrer – Founder Liquidware Labs/VDI.com and formerly of VMware/Foedus; Ruben Spruijt – CTO PQR and blogger BrianMadden.com; and a host of others that defined this space from inception to implementation over the last decade plus. My colleagues and I hope that you enjoy the first in the four book series and that the unique user perspective enables you to adjust your strategy where needed to achieve desired results based on your business. 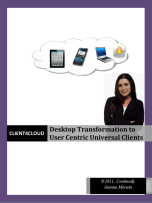 We’re applying the finishing touches on the upcoming book, Client4Cloud: Desktop Transformation to Dynamic Universal Clients. The Kindle version will be available for purchase through Amazon.com.